Like many parents, I want my child to grow up and have a deep respect for this place we call home. Yet with the pressures of work, friends and family, it is sometimes hard to know what parenting technique is most effective at conveying my value of environmental stewardship. As a child, we did not hike or camp, yet I romped through the neighborhood playing army and as teen flitted in the forests of central Michigan “acting out” roles as fearies and townsfolk at the Michigan Renaissance Festival. Just how important were these play sessions? Was it those or the countless episodes of NOVA that led me to who I am today? Is getting kids outdoors the answer to creating nature stewards? Direct research investigating “significant life experiences” and their affiliation with environmentally responsible behavior investigates these assertions. Researchers Wells and Lekies (2006) interviewed 2,000 demographically representative American adults living in urban areas. They asked participants questions about their childhood nature experiences and their current attitudes and behaviors related to the environment. They found that childhood participation in nature such as hiking or playing in the woods has a positive relationship to environmental behaviors. Chalwa (1999) conducted interviews with 56 environmentalists both in Kentucky and Norway to determine the source of their environmental commitment. Upon interviewing these environmentalists, the leading explanation given for commitment was again experience of natural areas in childhood. 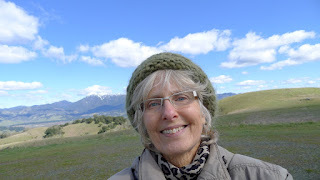 Researchers Palmer, Suggate, Bajd, and Hart (1999) constructed autobiographical narratives with 1,200 environmentally active individuals in the United Kingdom, Australia, and Canada. They found that again childhood time in nature was a very salient factor. So what is a mom, dad, grandparent, aunt, or uncle to do that does not yet know how or where to hike with kids? Starting this fall, Pepperwood will be launching a new initiative: Family Fun al Fresco - Diversión familiar al aire libre. This program will give diverse families more access to Pepperwood. We will continue to offer family classes and overnights as well as new bilingual family hikes. In the meantime, we are very lucky in Sonoma County to have access to a myriad of Regional Parks and folks like Landpaths that partner with Pepperwood to link families with nature. So, if you want to raise the next great environmental writer, scientist, policy maker, or even avid composter get those kids outdoors and do it often! TeenNat is an internship program for teens offered by Pepperwood. Each week of this internship has a different emphasis. 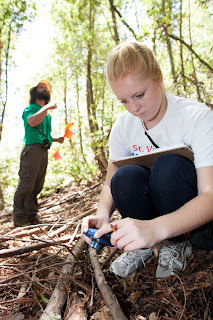 During one week of TeenNat, we researched redwoods and ferns. We were researching how ferns affect redwoods and how the ferns themselves are changing. Specifically, we were doing research on sword ferns. We were researching how the drought has affected the ferns and redwoods. Before I started working with the ferns, I knew nothing about them. Learning about ferns and how they affect the redwoods was a great experience. We were assigned random plots and we cataloged the ferns in each plot. 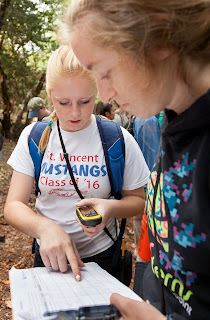 We counted the number of ferns, their GPS location, and whether the fronds were fertile or infertile. Fronds are the leaves of the ferns. Because of the drought, we found that these fronds had been shorter than in past years. Not only that, but the number of fronds themselves had gone down. The most interesting thing however, was the decrease in spore count. The spores are called sori, and they are yellow or orange dots all over the fronds. Fronds that are not fertile do not have sori. Our findings varied from plot to plot. Some plots had one or two ferns, where others had as many as ten ferns. Each plot was different, and each one contained different information on the sword ferns. Our research required us to scale steep hills and push our way through bushes to get to the plots, but it was worth it. Our data was given to Emily Burns, the research director at Save the Redwoods League, who used the data to contribute to the information they had already collected at other sites. 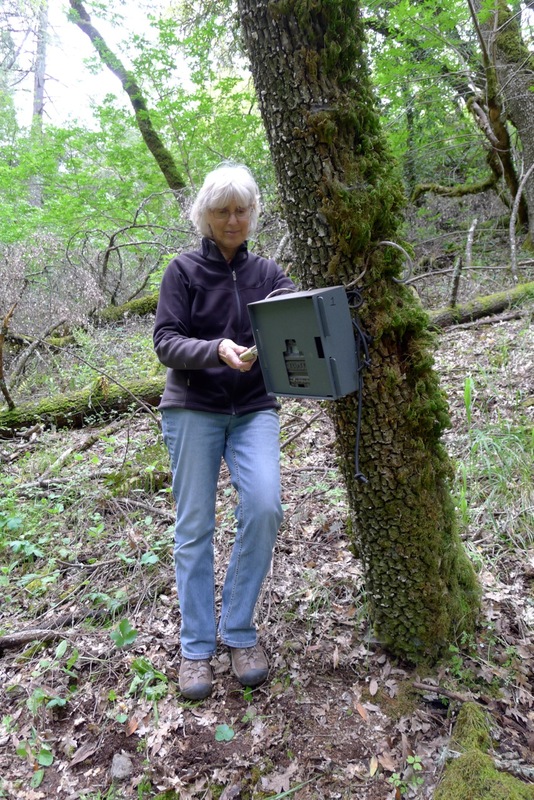 Our research was also the first “citizen-science effort to completely install and census Fern Watch plots independently.” It was hard work, but it was extremely rewarding. Not only was the research helpful to the redwood scientists, it was fun as well. 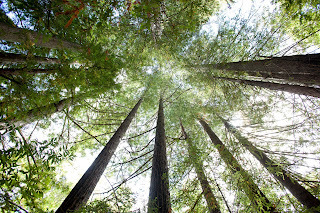 I had a great time working with the ferns and redwoods. I love spiders. All other arthropods included, but mostly spiders. The only problem is most people don’t love spiders. It’s rare for me to find someone to talk to about spiders I used to just keep it all to myself, recording what I found and leaving it at that. That is, until I was introduced to iNaturalist.org during my TeenNat summer internship. I think the best way to describe my discovery of iNaturalist.org is as a window opening: I knew there must be other spider nerds out there like me, but I just didn’t know how to find them. iNaturalist.org is like social media for scientists and being someone who isn’t a scientist (yet) it is so cool to think that I have the opportunity to not only view the findings of professionals, but to also put my own discoveries out there. During TeenNat we had the daily recordings that we would put up onto iNat and we all found ourselves with anywhere from 20 to over 500 entries at the end of August. It was so satisfying seeing my findings over the two months, ranging from beetles to lizards and, of course, spiders. It seemed like I was receiving almost daily notifications that someone had seen or identified something of mine which was not only educational but also super exciting because what I was putting out was being seen. My only fear was that after TeenNat was over I would forget iNaturalist.org, that I would forget to put my entries in, and I would lose that connection with the iNaturalist.org community. But, the thing is, I couldn’t forget iNaturalist.org and it certainly didn’t forget me. Every time I saw a bug I would race to find my little blue camera and my field guides. Of course, as life kept moving faster I found myself with less time to play outside looking for new creatures, although I still ran across the occasional house spider that I simply had to share with the rest of the world. Every spider is special and adorable to me and deserves recognition. So now, here I am a year after my TeenNat experience, still logging entries into iNaturalist.org and going back to Pepperwoord whenever I am able. A part of my heart lives in Pepperwood, and being on iNaturalist.org is almost like being back with the rest of the group riding in the van to Turtle Pond, hiking up hills, counting Sword Ferns, and finding scorpions. iNaturalist.org is my connection to others who share my passion for spiders and insects, but more than that, it is my portal back to last summer. I was in the first class of Bio 85 at SRJC in 2009-10. The curriculum had just been developed by UC, and each week we were asked to evaluate the lesson. It was all fairly new to me so I gave each class the highest rating! I became a steward in 2010. I grew up in what is now Silicon Valley (Menlo Park), basically an urban environment, with Summer family vacations to the Northern California Redwoods where my father was born. I started hiking and backpacking only after my kids left for college. 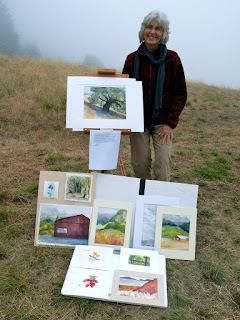 Janet with some of her paintings. I first came to Pepperwood for a landscape painting class through SRJC. I experienced the quiet beauty and open landscapes while painting for two weeks. On the last day, the class had an “art show” in the field at Bechtel House, and all the Pepperwood staff came, including Steve Barnhart, who announced the new Field Biology class at SRJC. 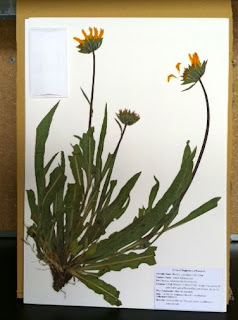 I enrolled that Fall; every season since has deepened my understanding of field biology and ecology. When I started looking for a steward project, Michael G. asked me and a student volunteer to help him unpack some wildlife cameras and place them outside. Gradually we gained some expertise, and we invited various consultants to help us with strategies for capturing the wildlife we knew was always here. Pepperwood was already on a research track, and although this project was mainly a survey, we learned how to archive photos for a data base, along with keeping field notes. My current camera partner is Pam Horton. 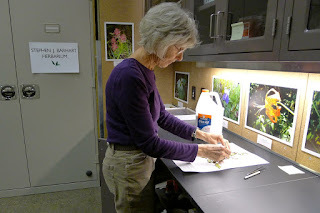 I began working with fellow Bio 85 student Amber Huntington, also in Fall 2010, and she introduced me to the Herbarium and collecting and mounting plants for the new Pepperwood Flora. This is my fifth season, and we see definite evidence of climate change: fewer plants in bloom and a later, quicker season due to the dry January. Also I enjoy helping with the hikes and classes and meeting all the people who take part in Pepperwood activities. Cerulean Blue, Sap Green, Raw Sienna. A completed pressing for the herbarium collection. After I retired (from 30 years as a Speech Language Pathologist), or even before, I wondered what I would do. For awhile I took French and painting classes but I felt I was just wasting time. I even returned to work part-time. After two years as a Laguna Docent working with children, I discovered Pepperwood, and it was a perfect fit for me. I am always learning new things, making lasting friendships, and spending time in a most beautiful and inspiring environment. Certainly the most exciting thing to me are the images we continue to capture with the wildlife cameras. I will never forget the first mountain lion, the first bear, and the cubs. And all the other little creatures who run in and out of view. 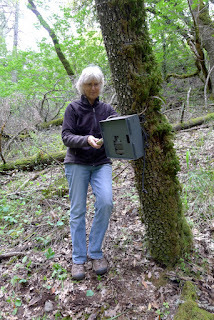 Janet with one of the wildlife cameras. I don’t have a science background and I still stumble with terminology and identifications. But gradually I have learned so much about the natural world! Everyone with an interest in nature will find a project at Pepperwood. When I am not at Pepperwood, I paint, work in the garden, hike and exercise, spend time with my children and grandchildren (who all have been to Pepperwood); I am a beginning piano student and practice every day. If there is any spare time after that, I read. 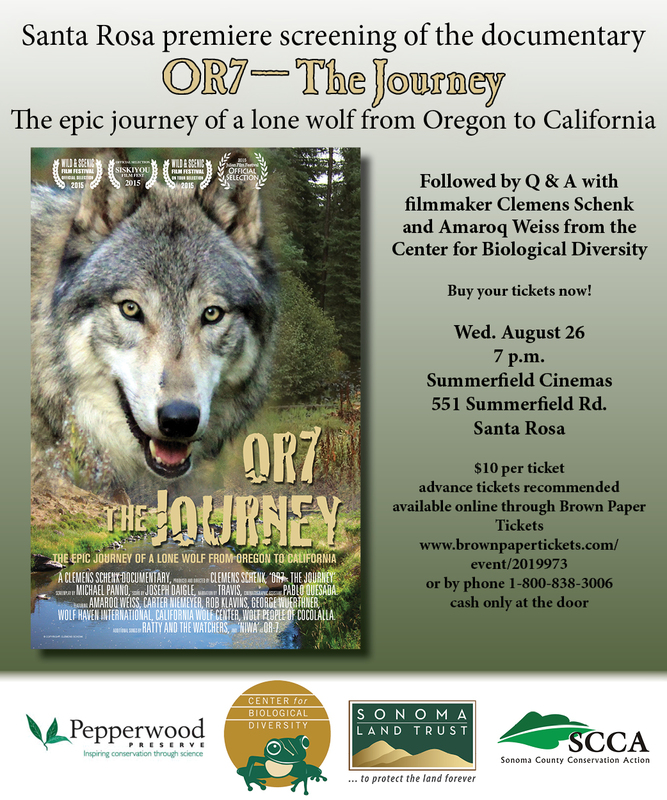 Join the Center for Biological Diversity, Sonoma Land Trust, Sonoma County Conservation Action and Pepperwood Preserve in celebrating the Santa Rosa premiere screening of the documentary OR7 - The Journey, an inspiring film about Oregon’s famous wandering gray wolf who even made his way into California. The screening will take place at Summerfield Cinemas at 551 Summerfield Rd. in Santa Rosa on Wed. Aug. 26 at 7pm. UPDATE: The Wed. Aug. 26th screening is SOLD OUT but due to popular demand a second night showing has been added on Thu. Aug. 27th, also at 7pm. Tickets are $10.00 and can be purchased here. OR7 - The Journey documents a remarkable wildlife success story that is taking shape in Oregon and the potential for regional recovery of wolves in the Pacific West. While Oregon's last wolf bounty was paid in 1947, wolves have begun to slowly rebound after they were granted protections under the federal Endangered Species Act in 1973. Oregon is once again home to a fragile, recovering population of gray wolves. All of Oregon’s wolves resided in the northeast corner of the state until one male dispersed from his pack in 2011 and made history by becoming the first documented wolf west of the Cascades since 1947, and the first in California in nearly a century. In the process, he inspired people around the world and has become an ambassador for recovering native wildlife. That wolf was dubbed OR-7 by biologists and was given the name “Journey” by schoolchildren in a naming contest. The film tells Journey’s story, not just as an adventure thousands of miles in the making, but representing the return of his species to their native habitats. It explores an awakening in how Americans view native wildlife and wild places, and the increasing conflict between 21st century science and values, and the old prejudices and politics that put the future of wolves - and OR-7 - in jeopardy. Click the image to the left to watch the trailer. Come celebrate wolf recovery, wildlife, and OR-7's epic journey. A Q&A session will take place after the movie with filmmaker Clemens Schenk and Amaroq Weiss of the Center for Biological Diversity. Since California’s state wildlife agency will soon be releasing for public comment a draft state wolf plan, this film screening and opportunity to ask questions about wolf conservation could not be more timely.